The past 12 months have been very successful for Mitsubishi with the Japanese importer moving up to fourth place in overall Australian vehicle sales behind Toyota, Mazda and Hyundai. 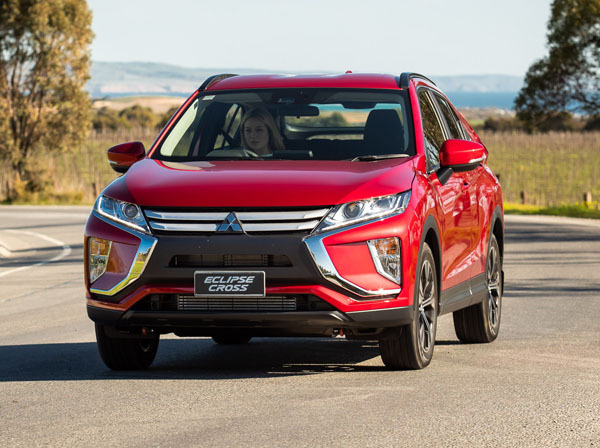 With sales of just over 7500 units during 2018 much of that success can be attributed to the most recent addition to the range, the Eclipse Cross which was launched at the end of 2017. Eclipse Cross is the fifth member of the Mitsubishi SUV family. It snuggles into the space between the compact ASX and the medium-large Outlander (all three sit on what is effectively the same platform), with the Pajero Sport and the large Pajero at the top of the tree. Between them these SUVs accounted for 61.4 per cent of total Mitsubishi sales in 2018. The popular Triton pickup was the biggest seller for the year with 29.2% leaving the traditional passenger cars Lancer and Mirage with a mere 9.5%. Eclipse Cross was launched in December 2017 with three variants, LS 2WD, Exceed 2WD and Exceed AWD. A new entry level ES 2WD was added in September 2018 allowing the starting price to squeeze just under the psychological $30,000 level. 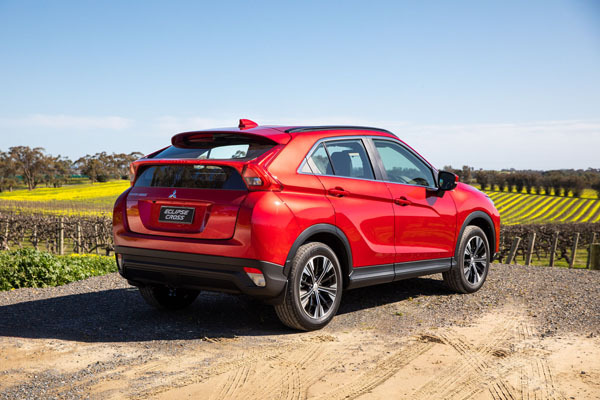 Eclipse Cross has the attractive coupe-like roofline that’s currently in vogue and gives the wagon an attractive and stylish profile. At the front there’s a big and bold version of the Mitsubishi Dynamic Shield grille that’s framed by twin LED headlamps, daytime running lights and recessed foglamps and turn indicators. The rear windscreen is split by a distinctive horizontal bar. All models get 18-inch alloy wheels and front foglamps. The flagship Exceed models add auto-levelling LED headlights and dual panoramic sunroofs although only the front section can be opened. The interior of the Eclipse Cross has a neat and functional design with most features easily accessible. The instrument panel has carbon and piano black accents as do the steering wheel, centre console and door panels. The lower dash, centre console, arm rests and air vents all have a high finish silver trim. Eclipse Cross only comes as a five-seater. If you need a third row then look to the Mitsubishi Outlander. Clever design provides the feel of a larger vehicle with plenty of head, leg and elbowroom in the front. The seats are wide and comfortable enough for long-distance driving, if you want power adjustment you’ll need to step up to the Exceed models. The steering wheel can be adjusted for both height and reach. There’s plenty of space in the rear seats with the added convenience of eight-step sliding and reclining adjustments. They can be moved up to 200 mm to adjust between rear legroom and boot space. Taller occupants will appreciate the tilt feature of the rear seats. Sadly, there are no air vents in the rear seats. The boot can cater for between 341 and 448 litres with the rear 60:40 seatbacks in place and up to 1122 litres when they’re folded. Storage includes a large double-compartment glovebox, centre console with sunglass tray and underfloor cargo box. All models are powered by a new-design lighter 1.5-litre direct-injection turbo-petrol engine with peak power of 110 kW, and 250 Nm of torque from 2000 to 3500 rpm. At this stage Mitsubishi Australia has no plans to add the 2.2-litre turbo-diesel, available in overseas markets, to the range. All models have a CVT automatic. If you don’t agree with the computer’s choice of ratio there are eight programmed manual overrides you can select with paddle shifters. Eclipse Cross Exceed AWD uses the latest Mitsubishi Super All-wheel Control with Auto, Snow and Gravel drive modes. 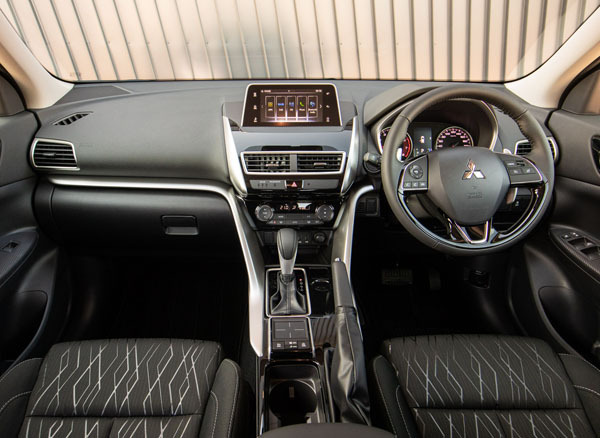 The multimedia system uses the Mitsubishi Smartphone Link Display Audio connectivity system and displayed on a 7.0-inch colour touchscreen at the top of the dashboard. The buttons are large and well positioned. One thing that we didn’t like was the Smartphone Display Audio touch pad controller. Unlike other similar controllers that are raised circular knobs this one is absolutely flat and very touch sensitive. So it needs far too much distraction from the road ahead. And it’s much too easy to accidentally tap it with your left hand and change settings. There’s no inbuilt satellite navigation in any model so you’ll need to access it through your smartphone with both Apple Car Play and Android Auto available. Digital Audio Broadcast (DAB+) is standard on all variants. There’s a high level of standard safety equipment across the range including seven airbags; ABS brakes with electronic brakeforce distribution and brake assist; emergency stop signal; automatic emergency braking; IsoFix child seat mountings; reversing camera; automatic headlights and windscreen wipers; and hill start assist. The LS adds lane departure warning and front and rear parking sensors. The top-spec Exceed also gets; rear cross traffic alert; blind spot warning; lane change assist; auto dimming inside mirror; head-up display and 360-degree ‘overhead’ cameras. There’s also a miss-acceleration mitigation system that reduces the chance or severity of impact with obstacles when the driver accidentally presses the accelerator when stationery or at speeds up to 10 km/h. Eclipse Cross Exceed also has a head-up display that can be set up to show ten different features. Visibility is fine to the front and side but the aforementioned horizontal bar across the rear window does restrict the view out the back. It’s not dangerously so, but annoying until you learn to tune it out of your vision. On the positive side the rear window bar has a wide LED brake light that is very visible to following vehicles. The 1.5-litre turbo-petrol engine is nicely responsive, quiet and well-suited to the on-road conditions for which it’s designed. The ride quality is quite bumpy especially at low speeds although it does settle once past about 60 km/h. Handling is pretty good for an SUV with less body roll than others in its class that we’ve driven. Steering is well-weighted but without much feedback. The 1600 kg braked-trailer towing capacity is better than the ASX (1300kg) and equal to the Outlander. Fuel consumption is listed at 7.3 litres per 100 kilometres with 2WD and 7.7 L/100 km with AWD. During our extended test of the ES 2WD we averaged far higher, at 9.2 L/100 km. Mitsubishi has joined the move towards longer standard warranties, moving from three to five years but – somewhat sneakily – without extending the previous 100,000 km distance limit. Mitsubishi Eclipse Cross is a very capable vehicle that should be on the test list for any prospective mid-sized SUV buyer. There’s a high level of standard safety equipment even in the entry level ES topped up in the range-topping Exceed. Note: These prices do not include government or dealer delivery charges. Contact your local Mitsubishi dealer for drive-away prices.